Melinda Lee's Turkey Basics includeing the Ultimate Brine and cooking the turkey upside down so the breast-meat stays juicy. If you are doing the Brine start now. What other last minute Turkey Cooking Tips? Obligatory links to the complete transcript of Alton Brown's "Good Eats" Thanksgiving Special and Tako the Octopus' adventure with deep-fired turkey. my family switched to upside-down about 10 years ago, and it really made a noticeable difference (not that turkey is so wonderful anyway). I'd suggest anyone using this site ignore the temperature notes, though. A turkey should be done to 180 degrees at the thickest part of the thigh, not 165. What other last minute Turkey Cooking Tips? #23: Be sure to cook it thoroughly enough to kill the salmonella, 'cause the FSIS ain't gonna help you there. For something different, have fun with foil on this year's bird. Crush the garlic and butter together making garlic butter. Add some cinnamon to the mix. Take out the gizzards and cook them with water, then take the water and add it to the turkey as baste. Cover the turkey in butter garlic and pour the booze over the turkey. Use a ladle every 30 mins and repour the liquid over the turkey. Soyjoy I won't eat the turkey raw, thanks. Keyser Soze, Evans is one of the highest salt content whiskeys I've ever had. The higher the salt content, the lower grade whiskey to mask the taste, in this case it would be a good thing as the salt acts as a brine. Back when I was a meat-eater, I'd cook the bird with the stuffing stuffed between the skin and the meat. It serves to keep the juices from escaping. And the stuffing tastes fantastic. Hmm.. good thing you told me. I was almost ready to finish off the bottle but I need to watch my salt intake. Egad, no. 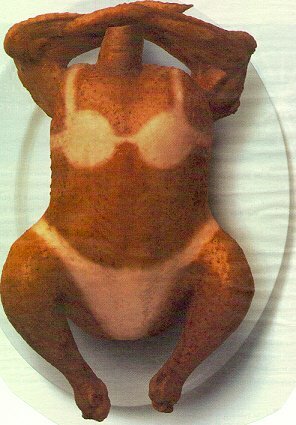 The turkey should be done to 180 degrees at the thickest part of the thigh and in the breast at the same time. This is achieved by using the techniques laid out in the thread from a day or two ago where we discussed much the same stuff. 180 degrees is way overcooked. Slow cook it. Google it and do that. It'll take several hours but you'll really be pleased with the results. Also has some good advice. speaking of fff: if you happen to read this, and feel so inclined, send me a quick e-mail one of these days, since you don't have one listed in your profile. I have something that may be of interest to you. I've never understood why anyone would prefer the white meat over dark. I suppose the white is leaner (healthier) but for flavor, doesn't dark win by a landslide? Hey, thanks for the reminder, The God Complex, on the pumpkin pie. Oh, and if anyone still wants that stollen recipe, (biffa?) email me. I found a paper copy. I have to vouch for using a free range turkey instead of a buy $50 worth of groceries and get a turkey for free kind of turkey. My mom, Pope Dorothy of Rochester, makes a mean turkey but her gravy really makes the meal. (In my house, gravy is a beverage.) Her secrets, er, techniques - scrape that pan for all the goodness stuck to the bottom, use the water from your potatoes instead of tap water and then add some Wondra for splendid gravy. For mashed potatoes, please don't add all of your milk at once, get some delicious butter and maybe add some garlic and/or horseradish along the way. Some heretics even add cheese but that's just blasphemous. Thanks JanetLand - I made one a few years ago. They really are quite good (though I've long forgotten what "meat" tastes like) as long as they're not overcooked. Milk? That's just wrong! You should be using heavy cream and butter for your mashed potatoes. Roasted garlic is a happy addition. Also, for the truly decadent (and those with a second oven), if you let the potatoes dry in the oven for a while after you've cooked them, they'll soak up greater quantities of cream and butter, which is a good thing on a day devoted to the celebration of excess. Forget about the slow roasting, per Cooks Illustrated, I am cooking a butterflyed turkey for around 90 minutes in a 450 degree oven with cornbread stuffing below to catch the drippings. Getting the backbone out and breaking the breastbone was an ordeal though. Should be interesting to say the least. My personal favorite - came up with this myself: 4-5 cups chicken broth, 2 sticks butter, 2 cups pure maple syrup, 2 tbsp crushed red pepper flakes. reduce at low heat (keep stirring) for maybe 45 mins, or until it loses 25% of its volume, no more. Do this before & while the oven heats. Add 2-3 cups water or broth to the baking pan, and use a rack for the turkey so it doesn't hit the water. Add salt to water and rub into skin of bird; I assume you brined it overnight so it's already got a bit of seasoning though. Put cut up lemons, salt, and more chili flakes inside bird. Cook stuffing separately, not in bird. inject reduction into bird, maybe 20% of the liquid, using a meat injector. give it a good rub inside and out with a bit of salt and chili powder or the flakes. sour salt (citric acid) is also a great thing to add to the rub. Much of it will be washed off with the basting but will add to the baste liquid. use the rest of the reduction and the drippings to baste the bird every 20 minutes for however long you cook it (by weight). Keep checking it, using 2 people to pour off the lost liquid back into a (BIG) bowl, and re-basting every 20 minutes... 45 minutes before it's done take the foil off and baste again. let it stand out of the oven for 20 minutes after you finish the cooking. I've never understood why anyone would prefer the white meat over dark. Well, davebush, the answer to this question happens to be in this thread. Those who are not using some kind of foil method to protect the breast meat (see any of the Alton Brown links in thread) are overcooking the white meat by making extra double special sure the whole bird's meat is 180-185 F before serving. mmmmmShoeLeather. I have a turkey to brine and some pies to make. Those of you with strong feelings on turkey preparation should immediately get to work on the wikipedia Cooking a Turkey article. Last night I came up with a method of brining a larger turkey! I had a 20 pound turkey, which I quick-thawed with cold water in a 14 gallon cooler. This was fine, but when I went to brine it, I realized that not only did I not want to go throught the hassle of making 10 or more gallons of brine, I didn't have enough ice to keep it under 40 degrees for 8 hours. I took my largest stockpot, which was not large enough to completely submerge the turkey, but was large enough for me to get 90% of the turkey in if I stood it on end. I put a large oven bag in the pot, placed the turkey in the bag neck down, and poured in brine until the turkey was nearly covered and I still had enough bag left to close it securely. (It's best to have a helper hold the bag during the brine-pouring. )I got out as much air as possible and closed the bag with the included closer-thingie. With a little rearranging, I was able to fit the whole thing in the refrigerator. The tail and a small portion of the back peeked out of the brine after everything had settled, but who eats those parts anyway? The breast, wings, drumsticks and thighs were submerged, and those are the important parts. If you really wanted, you could jiggle the bag and splash some brine up over the tail every one in a while, but I don't think it's really necessary. Shoeburyness, that's genius! I was just sitting here thinking...how the heck could I brine a turkey as big as the one I've got...and there you were, with a solution. Thanks! An easy container to use for brining is a 5 gallon general bucket with lid that you can buy at any hardware store. I have successfully brined a 25 pound turkey using only 12 quarts of brine. You don't even need to rotate the bird since it is completely submerged in the brine. If you are serious about your meat cookery then you should have a brining bucket for poultry and pork so a trip to the hardware store is well worth it. A dedicated brining bucket is a Good Thing™. Furthermore, yesterday I discovered that a 5 gallon bucket will stand upright in a large cooler. Couldn't fit it sideways (then I could stand cooler on end, close it up) but I could fit a couple bags of ice around it. Old towels and a fleece blanket scavenged from the charity pile* provided more than adequate overnight insulation, as almost all the ice was still ice in the morning. Oh yeah, and having done Alton Brown's recipe last year, this year we are aiming for breast meat temperature of 165 F. Happy Thanksgiving, everyone! *Yes, I'm going to wash it again before giving it away! A 5-gallon crock is most traditional, looks cool and lasts forever (and no plastic residue).